My girl and I were on our own again Thursday night because R had his final concert of the year at the high school. I made a yummy dinner – Roasted Sweet Potato with Orange Cilantro Glaze and served it (to myself) with Quinoa and a side salad with Curried Chickpeas. It was delicious, but . . . I didn’t really get to enjoy it because this was happening almost the entire time I was trying to eat. She’d ask for something, I’d give it to her, she’d throw it on the ground. Rinse and repeat, with a few different things. Finally I gave up and called my parents to commiserate and tell them I was planning to leave her in the dining room on the phone with them and I was going to go on the back porch to eat my dinner in silence. As soon as she heard GeeMa and GeePa were on the phone, she was all smiles and dinner was saved! Bedtime was finally easier again and has been ever since, knock on wood! I think our new routine after bath and reading is a kiss and a hug and then off to bed. Smoothie photos (like any food photos I take) are probably pretty boring. But man, the color was beautiful on this one. I’m still loving these every morning. It’s been probably about 4 months that I’ve been drinking one of these for breakfast everyday and I am feeling great! I don’t even remember what it feels like to eat a bagel for breakfast. 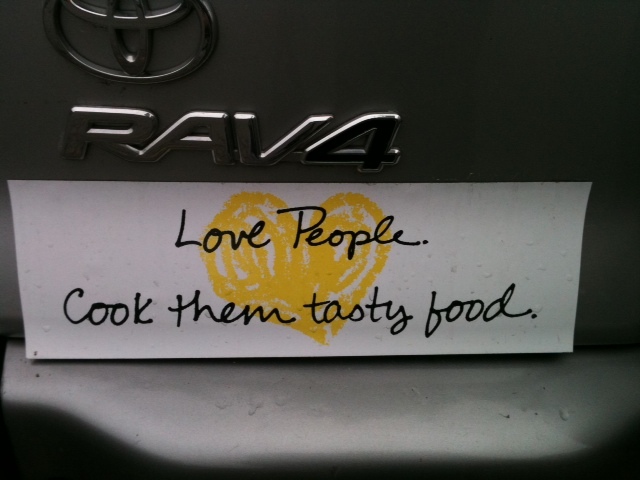 And finally, check out this bumper sticker on one of my co-worker’s cars. Love it. Apparently it’s from Penzey Spices. This entry was posted in Izzie, Miss M., Motherhood, Vegan, Whole Food Eating. Bookmark the permalink.